Jesus! I saw the title and I facepalmed. I read the thread and I started to hang myself. I found that some people were actually agreeing with you and I threw my computer out the window! I really hate that people with very limited info make theories and then say they're right, rather than what they think of this. DeathSkull3000 had it completely right. He was able to wield a keyblade when Ventus' heart was inside of Roxas, why wouldn't he be able to wield a keyblade if Ven's heart returned to his own body. I think Sora just needed to lose. From the start of the series, he's been able to do what others haven't and there hasn't been any point where's he been totally helpless or has completely failed. I think Sora needed to lose for once as a wake-up call, so he can see what his good and bad points are. Also, you're sort of right. I think Sora is very naive and he needs to learn to be more serious. He was beginning to see the error of his ways in KH2 but he's definitely still too trusting. As long as its not the KH2 version and Usula does not make an appearance, I will gladly welcome it back. As JTD95 said, the names Kairi, Sora, Riku, Aqua, Ven and Terra all have something to do with water, wind and earth. The name Roxas, is a mixture of a few words in Latin meaning something like Wild Wind I suppose. There's a better phrase than that, I just can't think of it. Anyway, it's supposed to represent his ties with Sora and the fact that he leaves the Organization. Axel means the one who follows his heart, ironically enough. Hayner's a bit different. It means hedge, basically, or it can mean living on an enclosed piece of land. Olette means small winged one. Pence means worker. None of these names really do a lot to describe the characters. Maybe Olette's name will, further on in the game, but I think they're just names that people liked and gave them to these three characters. I don't see why it can't be Sora if I'm being perfectly honest, he may have been borrowing Ven's power but not during the time that Ven's heart was inside of Roxas. During that time, Sora was using his own ability showing he can weild a keyblade even without Ven, making me believe he will be one of the seven. And if not him, then who? I also think you're taking the term 'original' too far. MX only says keyblade wielders. Sora can wield a keyblade. 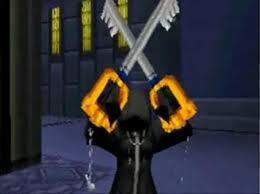 And his memories even allow others to be able to wield them as well (Xion). Roxas was using Ven's heart as well, so I don't see how you can say he's a candidate but not Sora. That's just confusing. Realistically, if it's not Sora then there isn't really anyone else who can take his place. Oh and by the way, I don't believe Nobodies can just grow feelings and hearts. Roxas' emotions comes from Ven's heart. Axel's apparent emotions probably come from his memories of Ven or something similar. Xemnas' emotions come from Terra's heart. And finally, Naminé. Although people say she has emotions, I have my doubts to be honest. I mean, she can easily tell Xion and Roxas that neither of them are supposed to exist. Seems pretty heartless to me. Well for one thing. In KH1, his parents became lost, don't forget than Destiny Isles was a world taken in by the heartless. It's more than possible, that Sora's and Riku's parents either got their hearts stolen by the heartless and when they returned in KH2, they had their memories rewritten and since Riku was with Naminé, she probably made it so no one questioned Riku's absence. Their parents memories were probably put right by Naminé towards the very end. Right. Let's see here. I doubt that MX split his heart and put it inside of Riku. Reason 1- There has never been any info that someone could split their hearts, except when Ventus' darkness and light were split and doing this caused huge damage to his heart, and it needed repaired by Sora. Reason 2- MX visited at night, only went to the actual island and not where the homes are and Riku was about two years old or younger. Probably in his cot sleeping or crying for his mummy. Not a great load of potential there either, if MX did see him. Reason 3- The incident was not mentioned at all in MX's reports. Riku and MX do have a connection however. Other than appearance. Terra and Zexion both thought that Riku was similar to MX and Xemnas. The connection will hopefully be revealed soon, but I don't think this is it. For one thing, I'm just gonna point out that you don't like my two favourite games in the series (KH2 and Days). As for your days review, well, I would probably only agree with you concerning the bosses, which admittedly were a pain to fight, particularly the ones in Neverland. I found the missions enjoyable. I don't think they're as repetitive as you make them out to be. And then you say they're worse than the Crisis Core missions?! Those missions were the exact same formula for each and every one! And they didn't let you explore nearly as much as they do in Days. And the enemies in Crisis Core were way too common for those easy missions to be enjoyable. But back to the subject, Days' missions were repetitive a bit. Not going to lie. But find me a game that doesn't do that when it uses a mission system like the one found in Days. One thing I find odd about this review is that you didn't even comment on the one thing that most fans pick out as Days' key flaw that makes it so bad. The gameplay. Kingdom Hearts Days has easily the worst game play in the entire series, although there were the additions of gears giving great combos and other such likes, Days did not handle very well. That is a flaw I will admit to. And seriously? Seriously? The story of Days is probably the best in the series! I think it's even better than BBS'. This is because, Days had mystery to it. It had suspense and you got really connected to the character's friendship and saw that they were really alone in this whole group and you know after playing KH2, that they're being lied to the whole way through. The knowledge given in KH2 makes you really appreciate a lot of moments in this game and it pulls it together as a really emotional. And really the dialogue, if not a bit confusing at times, is good. That whole thing with the ice-cream. Many reasons for it. One; realism. You can't expect someone who's only been alive for like a year to go into this big speech about his friend and besides she would die before Roxas could finish saying goodbye if he went for the lengthy version. Two; You can't go too dark and depressing in a Kingdom Hearts game, because of Disney (honestly BBS has very sweet and happy endings when you think that Ven is fine, living inside of Sora. Aqua saved her friend and is still living with their friendship still strong and Terra is fighting against Xehanort. The ending of Days may have seemed nice but if you've played KH2, you'll know that it's actually incredibly depressing). Three; that line is symbolic. Ice-cream was the symbol of their friendship. That line is saying, who else will be my friend. I'm also open to debate and I think you're dead wrong on a lot of what you've said here. Wow Aqua's voice actor isn't popular. I would have gone with her. But Jesse McCartney plays ROXAS and VENTUS, who are my fav characters. You should be the better man and dematerilize stereotypes. It's better to have an open mind. Just saying. And if these members are really a problem, you should have talked to a moderator about it or reported them if they bother you that much. 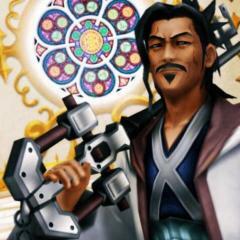 Anyway, take care Keyblade King. Keyblade king goodbye fellow order member hope all works out for you. Bro, I bead you farewell, I really enjoyed the talks we had, i'll miss you bro, you're in my heart. Now go! You're being quite defensive here. I think I get it now, Sora96 is secretly the Prime Minister of Australia and has plans to use KH13 to turn Australia into a completely independent nation. It makes more sense that Xehanort and Riku are apart of the same...nationality if you will. They share similar features because they were born in the same area and if you were to trace their family trees, you would probably find that yes, they are related but considering the differences between them; skin tone being the most obvious one. It's safe to say that they are not related very closely and only share similarities because of other circumstances. What game were you watching? How the heck was that soccer! ?